In established cancers, a subfraction of all cells with tumor-initiating cell (TIC) activity drives progression and metastasis formation. We have discovered that dynamics of TIC activity can fundamentally differ between different types of gastrointestinal cancers. In human colorectal cancer (CRC), a functional hierarchy of the TIC compartment with distinct types of TIC which differ in their self-renewal activity drive progression in vivo. In contrast, pancreatic cancer (PDAC) is driven by a clonal succession of transient TIC activity. At each time point in serial transplantation different sets of cells with acquired TIC activity are responsible for tumor growth and progression. Recent data from normal intestinal epithelium strongly indicate that under specific conditions differentiated cells can settle in a free “stem-cell-niche” and acquire stem cell properties. This phenotypic plasticity underlines that approaches which target a functional state, namely TIC activation, rather than a fixed cell population, may be needed to control TIC activation and activity. To develop rational targeting strategies against this most relevant cell population we here aim to understand subclonal dynamics of individual TIC in vivo and whether these can be exploited for specific targeting of TIC activity. Deciphering the role of candidate transcriptional programs regulating TIC activity in human gastrointestinal cancers and understanding their mechanism of action by addressing the transcriptional heterogeneity of colorectal cancer (CRC) TIC. Functional validation and subsequent mechanistic understanding of how selected candidate regulate CRC TIC activity in vivo. Examination whether identified principles are also relevant in cancers with fundamentally different structural organization, using Pancreatic Cancer (PDAC) as an example. 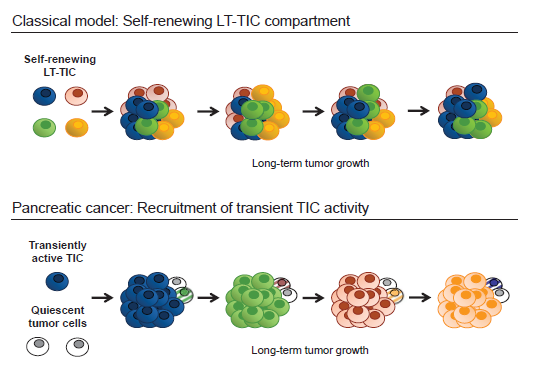 Two alternative models of clonal TIC dynamics underlying long-term growth of epithelial cancers in serial transplantation. 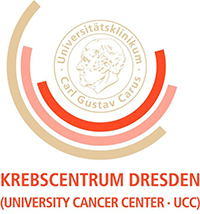 Heining C, Horak P, Uhrig S, Codo PL, Klink B, Hutter B, Fröhlich M, Bonekamp D, Richter D, Steiger K, Penzel R, Endris V, Ehrenberg KR, Frank S, Kleinheinz K, Toprak UH, Schlesner M, Mandal R, Schulz L, Lambertz H, Fetscher S, Bitzer M, Malek NP, Horger MS, Giese NA, Strobel O, Hackert T, Springfeld C, Feuerbach L, Bergmann F, Schröck E, von Kalle C, Weichert W, Scholl C, Ball CR, Stenzinger A, Brors B, Fröhling S, Glimm H. NRG1 Fusions in KRAS Wild-type Pancreatic Cancer. Cancer Discov. 2018 May 25. pii: CD-18-0036. doi: 10.1158/2159-8290.CD-18-0036. Giessler K.M. *, K. Kleinheinz*, D.l Hübschmann, G.P. Balasubramanian, T.D. Dubash, S.M. Dieter, C. Siegl, F. Herbst, S. Weber, C.M. Hoffmann, R. Fronza, I. Buchhalter, N. Paramasivam, R. Eils, M. Schmidt, C. von Kalle, M. Schneider, A. Ulrich, C. Scholl, S. Fröhling, J. Weitz, W. Weichert, B. Brors, M. Schlesner, C.R. Ball# and H. Glimm#. Genetic subclone architecture of the tumor-initiating cell compartment in colorectal cancer. J Exp Med. 2017 Jul 3;214(7):2073-2088. doi: 10.1084/jem.20162017. Dieter S.M., Glimm H. and Ball C. R. Colorectal cancer initiating cells caught in the act. EMBO Mol. Med. 2017 Jul;9(7):856-858. doi: 10.15252/emmm.201707858. Dieter, S.M. *, C.R. Ball*, C.M. Hoffmann*, A. Nowrouzi, F. Herbst, O. Zavidij, U. Abel, A. Arens, W. Weichert, K. Brand, M. Koch, J. Weitz, M. Schmidt, C. von Kalle and H. Glimm. Distinct types of tumor-initiating cells form human colon cancer tumors and metastases. Cell Stem Cell. 2011 Oct 4;9(4):357-65. doi: 10.1016/j.stem.2011.08.010.